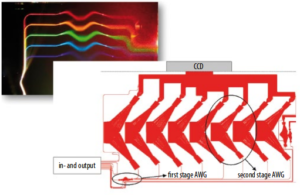 Proof-of-concept of a miniaturized spectral-domain optical coherence tomography system, based on photonic integrated circuit (PIC) technology. The integrated optics 512-channel spectrometer consists of cascaded arrayed waveguide gratings (AWG) with the output waveguides directly attached to a CCD detector. The spectrometer has a center wavelength of 850 nm and a spectral sampling interval of 0.22 nm. The PIC has a footprint of only 2.0 cm × 2.7 cm. Click here to download the article. The added value comes with integrated photonics. Technobis systems are lighter and compact, more stable, more accurate and need less power. Click here to read more (in Dutch). 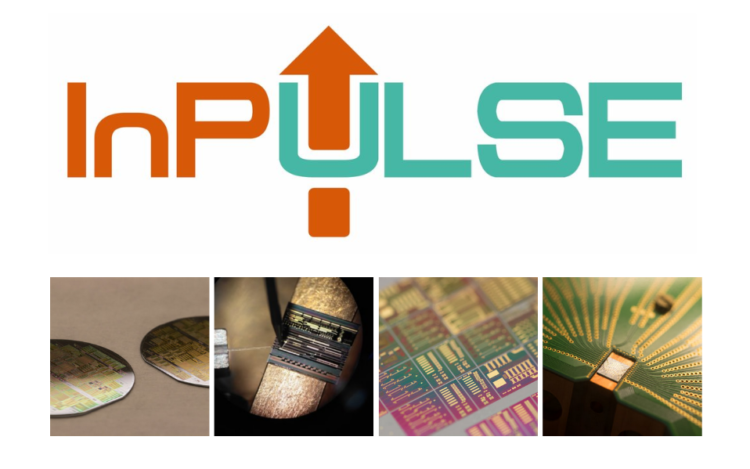 The four-year project InPulse kicked off in Eindhoven on 23 January 2019. It will offer new-entrant companies direct access to state-of-the-art manufacturing of photonic integrated circuits (PICs) based on indium phosphide. This will enable the development of products for a wide range of new markets. 16 European partners have started InPulse to reduce barriers and accelerate development. They are backed by 14 million Euros of funding from the European Commission. The pilot line will enable innovators to develop products fast, thus being able to focus on their products rather than the technologically complex task of fabrication. Click here for more details. 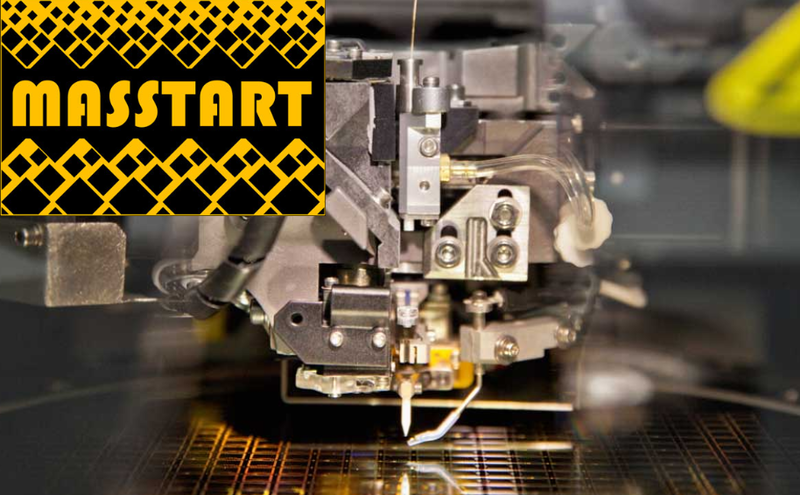 MASSTART started on the 1st of January 2019 as one of the fourteen new launched Photonics projects in framework of European Commission ’s H2020, Photonics21, PhotonicsEU. Partners are: CEA-LETI, ADVA Optical Networking, Mellanox Technologies, ficonTEC Service GmbH, Teem Photonics, BRIGHT Photonics, ALMAE technolgies, Aristotle University of Thessaloniki, DustPhotonics Inc., Tektronix. MASSTART will focus on MASS manufacturing of TrAnsceiveRs for Terabit/s era. Click here for more details. L3MATRIX: 2D Silicon Photonics matrix at ECOC 2018. Interview with Kobi Hasharoni (CTO, Dust Photonics) at ECOC 2018 explaining the L3MATRIX 2D Silicon Photonics matrix with 64 modulators and integrated lasers. "This is a world first shown at ECOC 2018. The idea of this L3MATRIX project was to demonstrate feasibility for co-packaging optics; this is the basic building block. The Silicon Photonics matrix is flip-chip assembled on a switch ASIC and handling the entire chip I/O. L3MATRIX co-package is a new technology, which is evolving." Click here for more details. EPIC interviews Bright Photonics CEO, Ronald Broeke, about his vision and his advice to young aspiring entrepreneurs. Click here to read the complete interview. BRIGHT & Nazca won the PIC Hero Award! 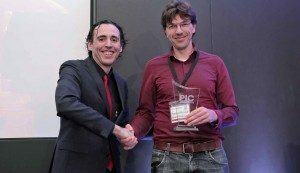 BRIGHT Photonics and Nazca Design are the winners of the PIC Hero Award 2018. Thank you for your votes! In 2017 BRIGHT launched “NAZCA Design”. A state-of-the art free and open source PIC design tool for mask layout and more. It highly stimulates open access and open innovation for commercial and research projects. NAZCA turns out to be a game changer. While sharing PIC design for free with the community, the core business of BRIGHT Photonics remains quality driven commercial product development support for PIC based applications. "Current OCT systems are large, bulky, and expensive, what has prevented a breakthrough in other application fields. Photonic integrated circuit technology is a key enabler in facilitating the development of OCT systems for hand-held applications." It is very rewarding to see that our Bright Photonics designs work together with LioniX International and their technology drives innovation in cancer research. For more details check the Photonics News. Photonic ICs were featured on Dutch TV in RTLz “Doe Maar Duurzaam”. The item showed applications and how open innovation makes designing PICs more accessible with http://nazca-design.org/. "Technobis Fibre Technologies, a part of the Technobis Group, of Alkmaar, the Netherlands, has been developing and collaborating in aerospace projects for years. Technobis Fibre currently does so using photonic integrated circuits, which combine many optical elements into one chip and allow modulation and detection of light." Bright Photonics, who designed the chips for Technobis is proud to be part of this journey into space! Technobis shares the story of replacing large, heavy, expensive and power-hungry systems for vehicle health monitoring with photonic integrated circuits. Smaller and lighter, their products also became thousands of times more accurate. Being responsible for the chips design, we are very happy with Technobis success! To cope with the growing capacity and coverage demand for wireless services the EU-COMANDER project has proposed a Next Generation Network that merges the optical and wireless infrastructures. A key component thereof is a Remote Access Unit, designed as a photonic integrated chip by Bright Photonics BV. For more details check PIC Magazine. OptiGrip, a sensitive instrument for performing minimally-invasive surgery, is one of the first medical instruments in the world using integrated photonics. "It controls the handling of the tissue in case the surgeon would mistakenly apply too much force on the tissue; the force will be optimized unnoticed by the surgeon to guarantee safety in all situations." We consider ourselves extremely lucky to design photonic chips for such an innovative product!